The Sunkar International Ski Jumping Complex is located in micro district of Gorny Gigant in the southern part of the city at an altitude of 900 metres above sea level in a unique place where there is almost no wind. 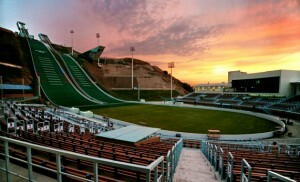 The complex was built in 2010 on the site of the old ski jumping complex with 5,500 seating capacity. It consists of five ski-jumps: K125, K95, and the training ramps K60, K40 and K20. Both artificial turf and snow can be used in every season. The complex also features a permanent multifunctional building with stands for 5,500 seats, a media press centre, a hotel, snowmaking and irrigation systems, a chairlift and underground car park, track and finish area for Nordic Combined, and a helipad.